August 30, 2013 – On Thursday Boeing marked the launch of its 787 Dreamliner customer training campus in Miami, it is the company's largest commercial aviation training campus. Aeromexico and LAN Airlines are Boeing’s first two customers to train on the 787 suites at the Boeing Flight Services Miami campus. Boeing has greatly enhanced its overall training capability in Florida following an announcement in March 2013 that the company would relocate training devices from Seattle to Miami. To better serve airlines and meet growing personnel training requirements, two 787 full-flight simulators are now located at the Miami campus as well as an additional Next-Generation 737 full-flight simulator and 717, 747 and 767 simulators. Later this year Boeing will provide the Miami campus with a 777 simulator. These seven devices will bring total capability in Miami to 17 full-flight simulators across airplane types, making the campus one of the largest commercial flight training facilities in the world. Boeing also established Miami as its pro forma flight training campus for the Americas, the location where airline crews will receive the initial training provided to Boeing customers for new model airplane introductions. "Miami has always been an important Boeing training campus and the largest campus in our global network. Now it will also play an expanded role in training the pilots and technicians who will fly and maintain the groundbreaking 787 Dreamliner," said Sherry Carbary, vice president, Boeing Flight Services. "Miami's location at the crossroads of the Americas offers tremendous advantages as a preferred location for airlines based in Latin America, Canada and the United States. Customers also travel from Europe, Africa, the Middle East and China to conduct training in Miami." "Aeromexico sees the expanded capabilities at the Miami campus as a very positive move," said Max Alvarez, vice president, Fleet Negotiations, Aeromexico. "This is a very beneficial development that will allow a savings in transportation times and associated costs for our airline." The consolidation of Boeing flight training campuses in the Americas is designed to bring training closer to where customers operate, reducing travel times for airline crews and the costs of sending students for training. Miami is an international hub for commercial aviation training and provides geographic diversity within the framework of Boeing's global commercial training network - and convenience that airlines prefer. "Boeing is adding nearly $100 million in training assets to the Miami campus, representing a significant positive impact for the local Miami-Dade economy," Carbary said. "The result will be a premier state-of-the-art training campus staffed by world-class qualified and experienced pilots and instructors all providing the highest quality training in a well-established, flexible and productive work environment." Boeing Flight Services, a business unit of Commercial Aviation Services, operates a geographically diverse network of 20 flight and maintenance training campuses on six continents. 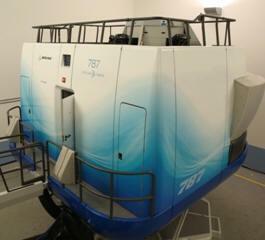 In addition to Miami, Boeing offers 787 training in strategically located campuses in Singapore, Shanghai and London.